Ensenada México es una guía en la que encontrarás mucha información sobre esta ciudad bajacaliforniana y su Municipio. Con dos extensas costas, una productiva zona vinícola, sierras montañosas con bosques de coníferas, y un clima mediterráneo, Ensenada ofrece una amplia variedad de opciones de vida a sus habitantes así como también a sus visitantes. En esta guía los ensenadenses y los visitantes podrán encontrar información turística así como sobre servicios. Entre abril y junio las horas tempranas y las nocturnas son frescas; mientras que durante el día el calor es moderado. Entre julio y septiembre el calor diurno es generalmente algo cálido pero muy adecuado para los deportes en el mar. De diciembre a marzo suele llover bajando la temperatura hasta alrededor de los 10 centígrados. En general el clima de esta región no es extremoso. Por esto Ensenada es nuestra ciudad favorita. 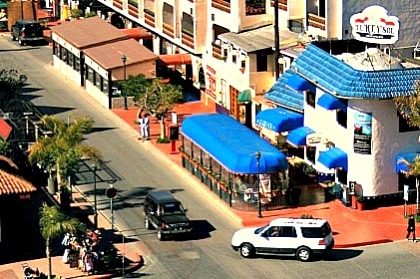 Calle Primera, zona turística de Ensenada. ▲ Smartphones: encuentra el INDICE al final de cada página. With two extensive coasts, vineyard countries, pine tree forests, mountain ranges and a pleasant climate, Ensenada offers a plethora of choices for couples, families and the adventurous traveler. This Ensenada travel guide will help you enjoy Ensenada, a semi explored municipality tucked in northern Baja California Peninsula. When you come to visit Ensenada between April and June, you will experience fresh mornings and evenings, and during the day you will notice a moderate heat. Between July and September, the daytime heat is somewhat warm and highly suitable for sports in the sea. The rainy and cold days are typical of the holiday season, although some years the cold weather starts in February. In general the climate of this region is not extreme. And this is why Ensenada is our favorite city. Boating, camping out, golfing and wine tasting. Horseback riding and basking in the sunshine. These are some of the activities you may enjoy, all them seasoned with the warm friendliness of the Ensenadians living here. Currenttly in the city of Ensenada, the number of scientists is greater, proportionally speaking, than in other locations in Mexico. Scientists, professors and researchers, populate the campuses of Ensenada, enriching the academic atmosphere of the city. Among these, there are English, German, Japanese, American, Mexican and scientists of other nationalities. No matter what your plans are in Ensenada. In this Ensenada travel guide you will find up-to-date information –gathered from our personal experiences- that will save you time and hassle in planning your next visit to Ensenada. My wife and I have lived here for more than 20 years, enough time to explore this semi-populated Baja California area. At this website you will discover both the authentic local side of Ensenada and its tourist facilities. The Wine Route is one of the main attractions of Ensenada Mexico. Visiting some of its more than 100 wineries is an exciting adventure in which you can enjoy the landscape covered with orchards of olive trees. A winding road connects wineries and restaurants. The gastronomic offer is very varied: from international cuisine to Mediterranean-style menus. From signature dishes to spicy tacos. Obviously, in this area there is always the possibility of tasting the different types of wine in each of the wine houses, including organic wines.